Hi Sylvie.....well at least you managed your post and hopefully you will get things sorted out soon. Oh dear Silvie, I wouldn`t know where to start if that happened to my blog. This post seems fine though and your comment on mine came through so hopefully it`s not too serious. Your card is fabulous. Love all that embossing. Well I love what you ended up doing with the charm it works brilliantly! Isn't google a pain in the backside at the moment, I wish they'd leave it alone. 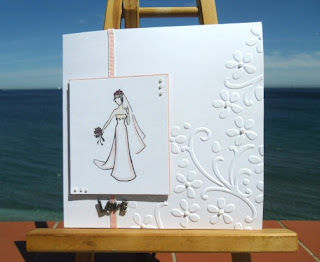 Super card, I love the embossing folder and lovely bride image. The weather in Gib looks wonderful, wish we had some of it here. Hi Sylvie, I love the embossing and the card looks wonderful to me. It was SO lovely to meet you too Sylvie... and your crafty buddies. Meeting the bunch of LIMettes altogether was awesome! I'm glad you got back safely. Hopefully your blog troubles will sort themselves out very soon. This is lovely, the embossing is fabbo and the charm is super. beautiful wedding card, sylvie!! sorry you have had problems with blogger... it is such a pain!! lovely card sylvie,I really like the embossing, i'm hoping to get to the november show as I never get to go anywhere usually! Sounds like there are a few people with bogger probs. Your card is lovely. Beautifully done - perfect wedding card - so very elegant!! So sorry for all your blogging troubles, Sylvie. Your card is so elegant and beautiful! I'm glad you were able to get it posted! Really lovely card - I hate this new version of blogger - it's pants! oooh sylvie what romantic card, beautiful! and perfect charm!. A very elegant and beautiful card Sylvie! Love that stamped image! Super classy card, very stylish. She's a very pretty bride, love your subtle colouring. Can sympathise with your blogging troubles...totally frustrating...hope all is going well now.